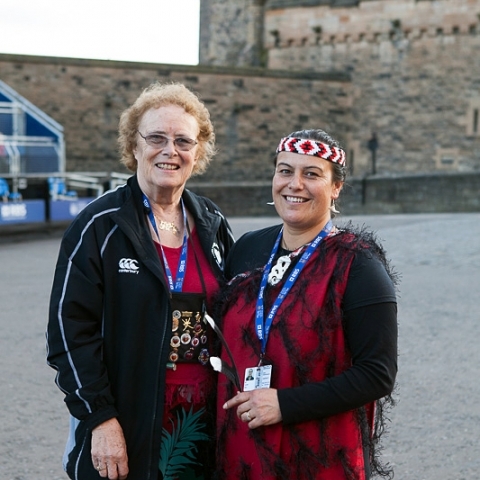 Annette Wehi shares what happens when you put two of New Zealand’s best Kapa Haka groups together on an international stage at one of the largest stages among the Assembly venues. You get: the HAKA. Performing not just at the Edinburgh Festival Fringe but also at the Military Tattoo. And yes, HAKA is all capital letters because this is a show that is big, proud and here in Scotland to bring the New Zealand’s Indigenous culture to the fore. Two of New Zealand’s best Kapa Haka performance groups, Te Waka Huia and Te Kapa Haka o Te Whanua-a-Apanui, have come together to produce an hour long experience curated by Wehi that provides a glimpse into our distinct culture and heritage from Aotearoa. And Edinburgh has embraced the HAKA with open arms. Audiences, according to Wehi, have been very responsive to the performance and eager to talk afterwards and even take photos. For many performers this is their first time leaving New Zealand shores and the logistics of organizing such a huge group is akin to asking a team to the Olympics and it’s been made even more complicated by the fact it’s not just one show but TWO as the performers are also participating in the military tattoo. “We have a gruelling time but we love it. The discipline is also particularly important for all our younger members who really have to pace themselves. We start at 9:30 am and we keep going till 11:00 pm. It’s not exactly a short day,” she laughs. Weaving through English translations, speaking directly to the audience and explaining each waiata in detail, Wehi generously cares for the audience as much as for all the performers. “We are cultural ambassadors overseas,” she says, “We are here, en masse, to put aside our competition (just for a wee while) and let people know that Kapa Haka performers aren’t just here to provide a showcase of Maori culture but are in fact actual bearers of culture and that this is not a one-off event – we practice and practice and practice and today we are known collectively as two of New Zealand’s top Kapa Haka groups and that’s something of which to be proud. In this particular version of HAKA Wehi also has a tribute to all the Maori soldiers who died in battle, tying in well with the theme of commemorating the anniversary of the First World War. At the end of the day the main motivation for Wehi, who has orchestrated this production, is the fact that as Maori, “we don’t leave our culture at home” and here in Scotland, the land, the air and the sea respond as Indigenous voices, stories and people once again resonate with this land’s own culture and history and pay respect to the imminent turning point this September when change with the referendum is inevitable. HAKA may be a cultural product to some who have limited experience with its versatility but it is indeed, as Wehi says, “a voice, a movement” and ultimately a homage to the past so we can move forward into the future.